So often questions and answers from those who come to the gallery are helpful to us. Sometimes it is only finding out what our friends and clients like, but that helps us know what they may be looking for next time they come by. Every once in a while we gain important insight into one of our works of art through our visitors’ comments. The other evening a colleague came in and was thrilled over our fan shaped drawing and spoke at length on what fabulous condition the drawing was in considering that it was about 400 years old. We noticed together that it had been folded and possibly it was kept in a box for most of these years. That would explain the state of preservation. I bought the drawing in France where such works tend to be preserved in family collections that go back a long way. The most illuminating piece of information we received in the last few days was about a drawing I bought knowing nothing about it, not even thinking that I, an old master dealer, was buying a drawing that was less than a half century old. My excuse, was that I liked it, it amused me. Turns out, there was much more to know. 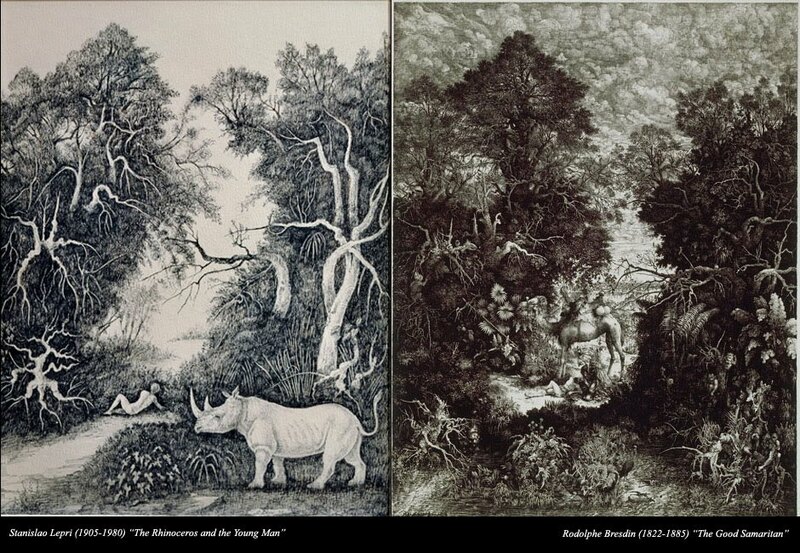 My colleague, a collector of later material, recognized that the drawing of a man fallen in the forest with a rhinoceros peering at him from around a corner was actually related to a print of a century earlier. 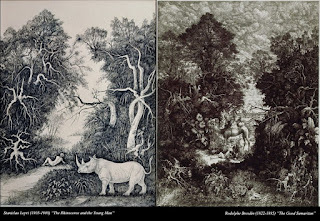 The drawing is by the Italian Surrealist Stanislao Lepri (1905-1980) and the print “The Good Samaritan” is by Rodolphe Bresdin (1822-1885). Though the drawing clearly does not represent the tale of The Good Samaritan, it is equally clear that the Lepri is “en homage” to the print. Note all the similar motifs, even the thistle at the bottom center. This is the new information we were able to add to our data sheet: The composition represents Lepri’s tribute to the 1861 print “The Good Samaritan” by Rodolphe Bresdin (1822-1885). The highly detailed fantastical landscapes of this idiosyncratic 19th century draftsman were much in line with the imagination of the later Surrealist movement. Bresdin was a friend and teacher of Odilon Redon to whom he taught etching and lithography. In an 1869 essay on Bresdin, Redon described “The Good Samaritan” as “an extremely strange and mystical dream, curious and disquieting.” Lepri enhanced the strangeness of the scene by eliminating the figure of the Samaritan and replacing his camel with a rhinoceros, unseen by the now-solitary naked figure in the clearing. The other morning, as I was working on this Missive, a distinguished Frenchman, clearly a connoisseur, came in to see Master Drawing New York. He particularly admired a drawing we have by the sculptor Pajou. It is an early neoclassical image called “Pyrrhus Presents Glaucias”. The artist used this image for sculptures he created 25 years later. The connoisseur asked where are the reliefs today, an excellent question. We went back to the 1998 Pajou exhbition catalog to sort out the various related entries. What we found was that a copper and two plaster reliefs were in private collections, one having been kept in Pajou’s family and owned by his descendants. A wax version in the museum in Anger, was given by the sculptor David d’Anger, who had received it from Pajou’s favorite student. All of this sheds light on how important the subject was to Pajou. I remember a case when we had a client come in and admire a terracotta sculpture that we had attributed to the 18th century French sculptor, Joseph-Chales Marin. It had come from a Rothschild collection attributed to Claude Michel Clodion who is a better known artist. We told this to our visitor and he said, “of course, it is Marin” as he pointed to the signature. This after untold visitors and scholars had seen the piece. A little embarrassing but also most helpful. Sometimes the obvious is missed. A good dealer has done his or her homework before presenting a work of art in the gallery but remember, even with New York’s Public Library, The Frick Library and the web to consult, nobody has all the answers.